Charlotte Daniel serves as Assistant Professor of Flute at Baylor University, where she also performs as a member of the Baylor Winds and as principal flutist of the Waco Symphony Orchestra. With the Austin-based wind quintet, QuinTexas, she claimed the Silver Medal in the Fischoff National Chamber Music Competition, the Coleman-Saunderson Prize at the Coleman Chamber Ensemble Competition, and Third Prize in the American Prize Competition in Chamber Music. Dr. Daniel has served as invited educator, performer, and adjudicator for the National Flute Association, Austin Chamber Music Center, Texas Flute Society, Houston Flute Club, Austin Flute Society, Texas Music Educators’ Association, Music Teachers National Association, and the Musical Merit Foundation of San Diego. As orchestral flutist, she has served with the Abilene Philharmonic, Austin Symphony Orchestra, Round Rock Symphony, Ann Arbor Opera, and in summer residencies at the Brevard, Bay View, and National Music Festivals. 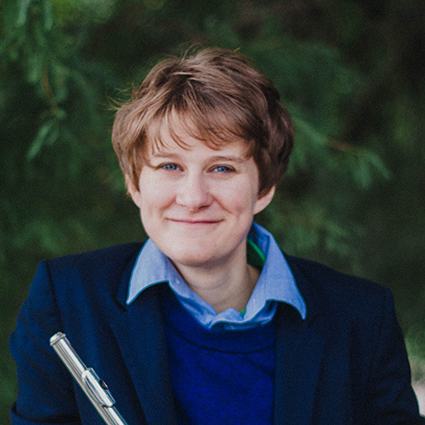 She received the DMA in Flute Performance from The University of Texas at Austin, MM in Chamber Music and Performance from the University of Michigan, and BM in Performance from Oklahoma State University, where she was the recipient of the Presser Scholar Award. Her primary teachers include Marianne Gedigian, Amy Porter and Conor Nelson.